Sound is produced due to the vibration of objects. Vibration is the rapid to and fro motion of an object. Vibrating objects are the source of all sounds Irregular, chaotic vibrations produce noise Regular, controlled vibration can produce music All sound is a combination of pure frequencies A stretched rubber band when plucked vibrates and produces sound. The disturbance produced by the vibrating body travels through the medium but the particles do not move forward themselves. A wave is a disturbance which moves through a medium by the vibration of the particles of the medium. So sound is considered as a wave.Sound waves Require medium for transmission.Sound waves are called mechanical waves. When a vibrating object moves forward, it pushes and compresses the air in front of it forming a region of high pressure called compression (C). When the vibrating object moves backward, it forms a region of low pressure called rarefaction (R). In these waves the particles move back and forth parallel to the direction of propagation of the disturbance. Such waves are called longitudinal waves. There is another kind of waves called transverse waves. In these waves the particles oscillate up and down perpendicular to the propagation of the direction of disturbance. Sound propagates in a medium as a series of compressions (C) and rarefactions (R). Compressions are the regions of high pressure and density where the particles are crowded and are represented by the upper portion of the curve called crest. The amplitude of sound wave is the height of the crest or tough. It is represented by the letter A. The SI unit is the same as that of density or pressure. The wavelength is the distance between the “crests” of two waves that are next to each other. The amplitude is how high the crests are. The pitch of sound (shrillness or flatness) depends on the frequency of vibration. The speed of sound is more in solids, less in liquids and least in gases. Sound gets reflected at the surface of a solid or liquid and follows the laws of reflection. The incident ray, the reflected ray and normal at the point of incidence all lie in the same plane. If we shout or clap near a reflecting surface like tall building or a mountain, we hear the same sound again. This sound which we hear is called echo. It is caused due to the reflection of sound. To hear an echo clearly, the time interval between the original sound and the echo must be at least 0.1 s.
So to hear an echo clearly, the minimum distance of the reflecting surface should be half this distance that is 17.2 m.
Echoes may be heard more than once due to repeated or multiple reflections of sound from several reflecting surfaces. This causes persistence of sound called reverberation. In big halls or auditoriums to reduce reverberation, the roofs and walls are covered by sound absorbing materials like compressed fibre boards, rough plaster or draperies. Megaphones, horns, musical instruments like trumpets, etc. are deigned to send sound by multiple reflection in a particular direction without spreading in all directions. Doctors listen to sounds from the human body through a stethoscope. The sound of heartbeat reaches the doctor’s ears by multiple reflection. Generally the ceilings of cinema halls and auditoriums are curved so that sound after multiple reflection reaches all parts of the hall. Sometimes a curved sound board is placed behind the stage so that sound after multiple reflection spreads evenly across the hall. Human beings can hear sound frequencies between 20 Hz and 2000 Hz. Ultrasonic sound is used to clean objects like electronic Components, used to detect cracks in metal blocks, used in ultra sound scanners for getting images of internal organs of the human body used to break small stones formed in the kidneys into fine grains. hammer, anvil and stirrup. 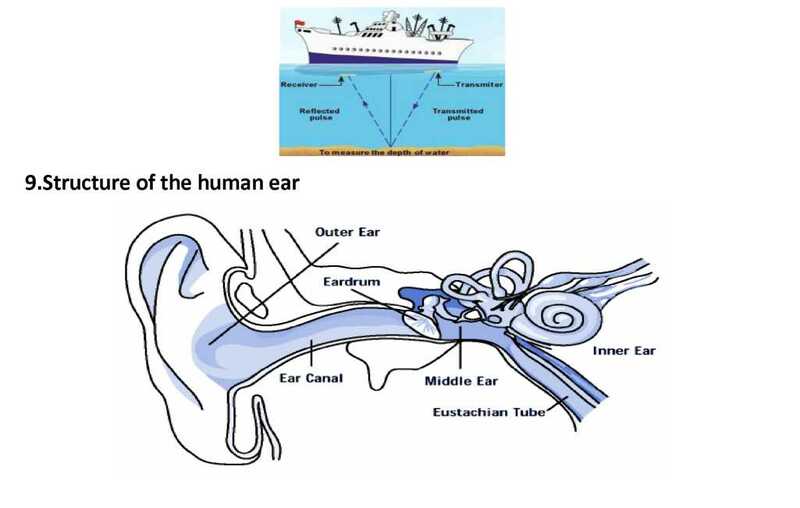 Middle ear then transmits the sound waves to the inner ear. The brain then interprets the signals as sound. What do you understand by sound waves? Give an example to show that sound travels at a finite speed. Is sound wave longitudinal or transfer. Name two quantities that vary periodically at a place in air as a sound wave travels through it . An airplane produces a sound wave with frequency of 5 KHz and wavelength 30 m. In how much time would the sound wave cover the distance of 4 Km? With the help of a diagram show how longitudinal waves like sound waves travel in air. Can we hear the ringing of a mobile phone placed in a vacuum chamber? Can two astronauts talk on moon a they does on the surface of the earth? Explain how echoes are used by bats to judge the distance of an obstacle? State the special properties of ultrasound that make it useful to us .In general, how these properties are utilized. Why is soft furnishing avoided in concert halls? Draw a diagram depicting low pitched sound and high pitched sound and write main difference between the two? Distinguish between longitudinal and transverse waves. Give one example each. An explosion takes place at the moon. After what time would it be heard at the earth? Two sources A and B vibrate with the same amplitude. They produce sounds of frequencies 1 kHz and 30 kHz respectively. Which of the two waves will have greater power? Find the time period of the source of a sound wave whose frequency is 400Hz. A sound wave travels at a speed of 340m/s. If its wavelength is 2 cm, what is the frequency of the wave? Will it be in the audible range? The grandparents and parents of a two year girl are playing with her in a room. A sound source produces a 28—kHzsound.who in the room is most likely to hear the sound? Sound cannot travel in vacuum. Describe an experiment to demonstrate this. With the help of a diagram describe how compression and rarefaction pulses are produced in air near a source of sound. Explain briefly how a flaw in a mental component can be detected using ultrasound? Explain the working and application of SONAR. A monkey drops a coconut from the top of a tree. He hears the sound of the coconut hitting the ground 2.057 seconds after dropping it .If the monkey was 19.6 metres above the ground, what is the speed of sound in air? (take g = 9.8m/s2). Longitudinal waves: Those in which the direction of vibration is the same as their direction of propagation. So the movement of the particles of the medium is either in the same or in the opposite direction to the motion of the wave. Exemple: sound waves, what changes in this case is the pressure of the medium (air, water or whatever it be). Sound is a wave motion, produced by a vibrating source. A medium is necessary for the propagation of sound waves. Sound is a longitudinal wave in which the particles of medium move along the direction of motion of wave. The part or region of a longitudinal wave in which the density of the particles of the medium is higher than the normal density is known as compression. The part or region of a longitudinal wave in which the density of the particles of the medium is lesser than the normal density is called a rarefaction. The point of maximum positive displacement on a transverse wave is known as crest. 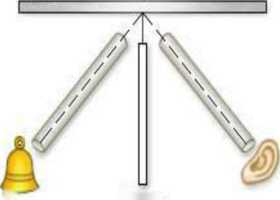 The point of maximum negative displacement on a transverse wave is known as through. A wave or short duration which is confined to a small portion of a medium at any given time is known as a pulse. The maximum displacement of particles of the medium from their mean positions during the propagation of a wave is known as amplitude of the wave. The distance traveled by a wave in one second is called wave velocity. It depends upon the nature of the medium through which it passes. Sound travels faster in solids than in air. The speed of sound in solids is much more than the speed of sound in liquids or gases. Frequency is defined as the number of oscillations per second. How the brain interprets the frequency of an emitted sound is called the pitch of sound. Loudness is the degree of sensation of sound produced. Sound gets reflected and follows the same law as the reflection of light. The persistence of sound due to repeated reflection and its gradual fading away is called reverberation of sound. Echo is a repetition of sound due to the reflection of original sound by a large and hard obstacle. Sound of frequency less than 20 Hz is known as infrasound and greater than 20 kHz is known as ultrasound. Ultrasound has many medical and industrial applications. SONAR stands for Sound Navigation and Ranging and it works on the principle of reflection of sound waves. The SONAR technique is used to determine the depth of the sea and to locate under water hills, valleys, submarines, icebergs sunken ships etc.